It's Christmas recipe week at Mystery Lovers' Kitchen! I have been waiting a long time to post this recipe. I included it in Not a Creature Was Purring, so the time has come. It's usually the very first thing that I bake for Christmas. While it's normally served at teatime in the afternoon with a nice cup of coffee or tea, we love it for breakfast! After all, it really is a yeast bread, even if it is sweet. 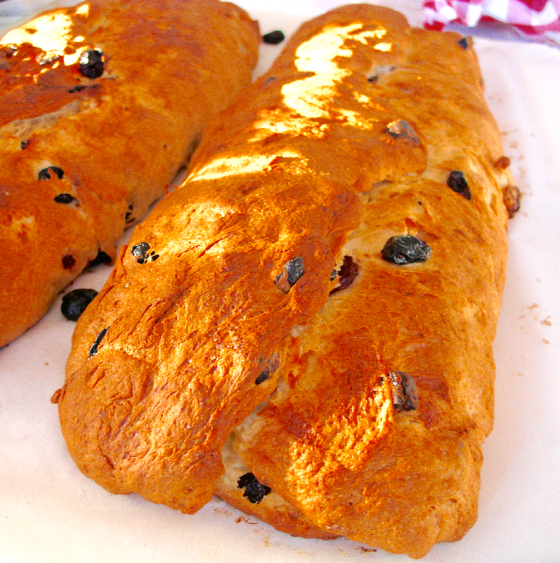 Traditional stollen is made with candied fruit. I don't find commercial candied fruit very appealing, so when the task of baking the stolen moved from my mother to me, I modernized it (don't you love the spin I give on changing up a traditional recipe?) with dried fruit. I'm partial to dried cherries and dried apricots, so that's what I use. But raisins would work well, too. Dried figs or dates would change up the flavor more, but if that's what you like, you could certainly try it. One word of caution—unsulphered apricots should taste the same, but they definitely won't be pretty when the stollen is sliced. In Not a Creature was Stirring, I wrote about Trixie getting in trouble with the stollen. In real life, that event actually happened to my little Buttercup. I don't want to spoil anything for those who haven't read it, but if you have a dog whose collar says Santa, I can explain . . . keep an eye on that doggy while the dough is rising! Do not take shortcuts when chopping the apricots. Trust me. Don't put them in any kind of food processor or chopper. You'll end up with a mess. There's nothing terribly difficult about this recipe. There are a lot of little steps, so the recipe looks long. But there's also a lot of rising time when you can walk away for a bit. But be sure to place it well out of reach of dogs when it's rising! I do recommend baking this on a day when you have plenty of time and aren't rushing off to do other things. The fabulous Kim Davis (no relation!) made my stollen recipe for her Cinnamon and Sugar blog. She even made a video of how to make it! Chop the apricots and cherries with a knife (do not use a food processor) and place in a bowl. Pour the rum over them and let sit for 1 hour. Pour the lukewarm water in a 2-cup or larger bowl. Sprinkle with the yeast and a pinch of sugar. Stir to help dissolve. Set aside (I put it in a cold oven) for 10–15 minutes. It should have doubled in size. Pour the rum from the fruit into a bowl and set aside. Lay paper towels out, and spread with the fruit. Dab with additional paper towels to dry. Pour the fruit into a dry bowl and sprinkle with 2 tablespoons of flour. Turn several times to coat. Set aside. Combine milk, ½ cup sugar, and salt in a heavy-bottomed pot and heat until the sugar dissolves and a thermometer registers 110°F . Remove from heat. Stir in the rum and the yeast mixture. Fit dough hook into mixer. (This may be made by hand, but a heavy-duty mixer like a KitchenAid is a big help.) Measure 4 cups of flour into a mixing bowl. With the mixer on low speed, slowly add the milk mixture. Whisk the 2 eggs well, then add to the dough, and continue mixing. Slowly add as much of the remaining 1½ cups flour as needed. Mix in the softened 1 cup butter. 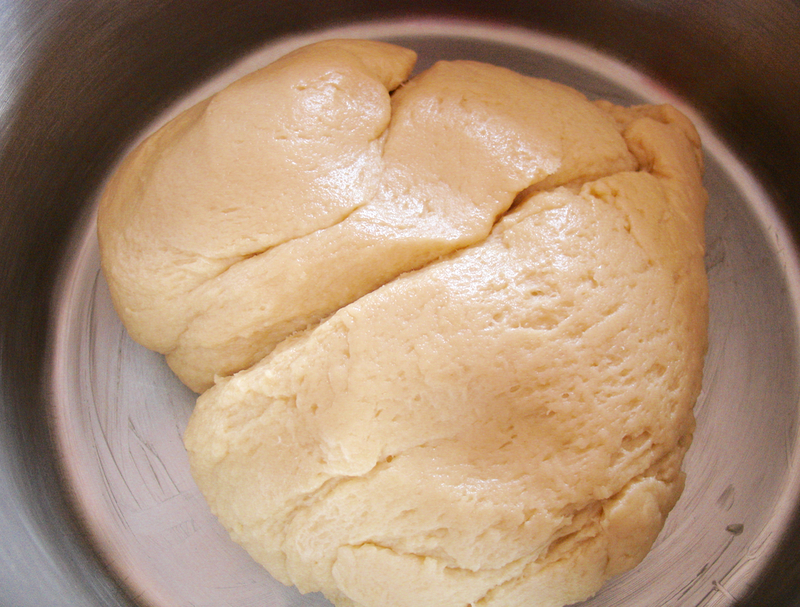 The dough should begin to shape into a ball. Dust your hands and kneading area with flour. 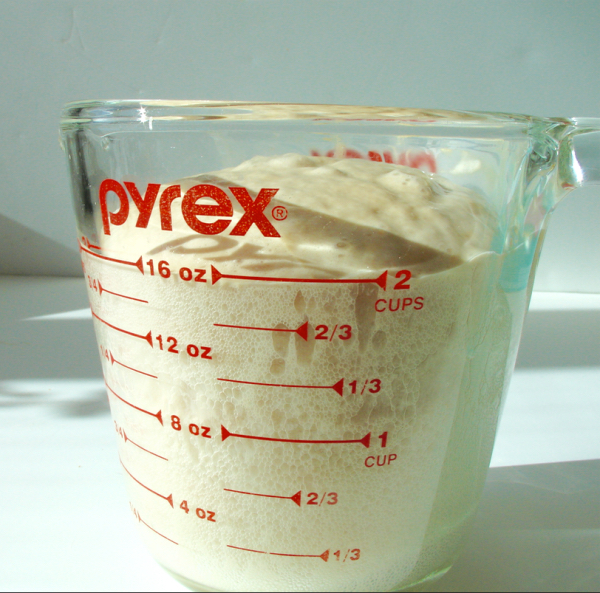 Remove the dough from the bowl and knead 10–15 minutes until the dough is smooth and pliable. Incorporate the fruit by pressing it into the dough a bit at a time. Flour your hands as necessary and continue to add the fruit and turn the dough. Punch the dough down and divide into 2 pieces. Allow to rest for 10 minutes. Working with one at a time, roll each ball of dough out into a rectangle roughly 12 inches long and 8 inches wide. Brush each with 1 tablespoon of melted butter and sprinkle with 1 tablespoon of sugar. Fold one side (of the 8-inch width) over about 2/3 of the way. Fold the other side over so that it overlaps the top of the first side by about 1 inch. Press the top seam gently. Shape it into an oval with floured hands as necessary, patting it so that it is approximately 4 inches across. Prepare a very large cookie sheet or lipped baking pan by covering with parchment paper. Transfer the dough to the parchment paper, leaving at least 3–4 inches between the two loaves. Brush each with 1 tablespoon of melted butter. Place in a warm location away from drafts and allow to rise for 1 hour or until doubled in size. Preheat oven to 375°F. Slide the baking sheet into the oven and bake 25–30 minutes or until they are golden brown and crusty. When cool and before serving, dust generously with powdered sugar . 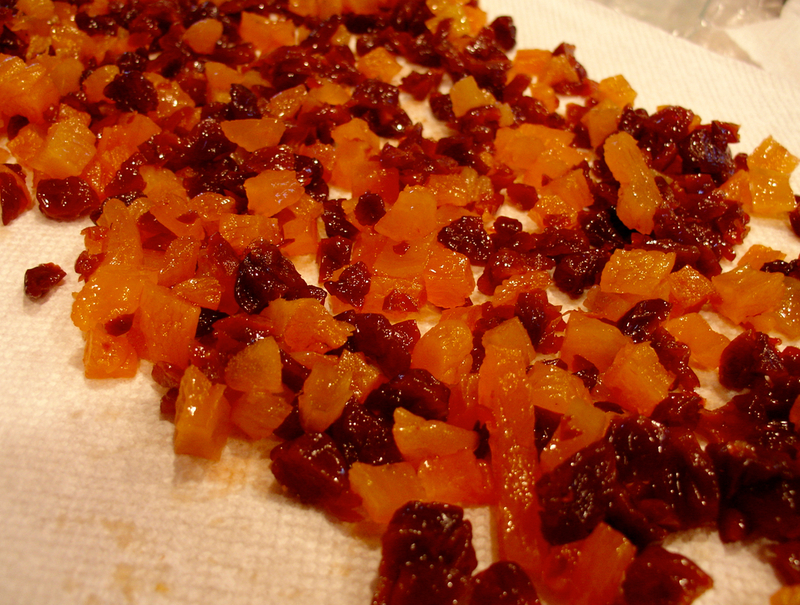 Chopped dried apricots and cherries. 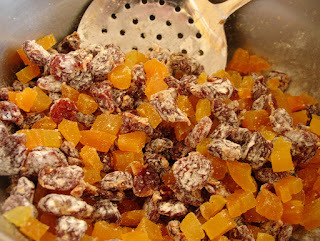 Dried fruit mixed with flour. 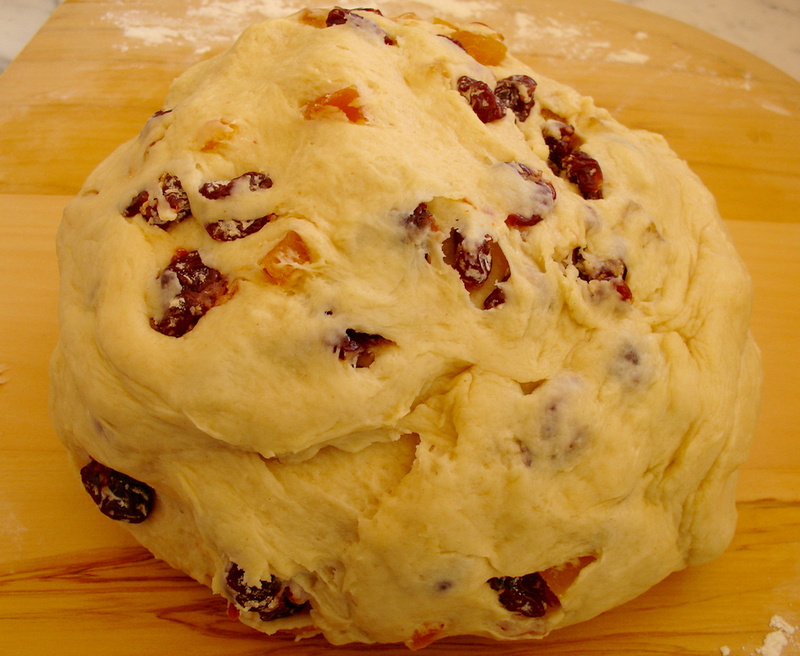 Dough with dried fruit incorporated. Fresh from the oven. All it needs is powdered sugar on top! 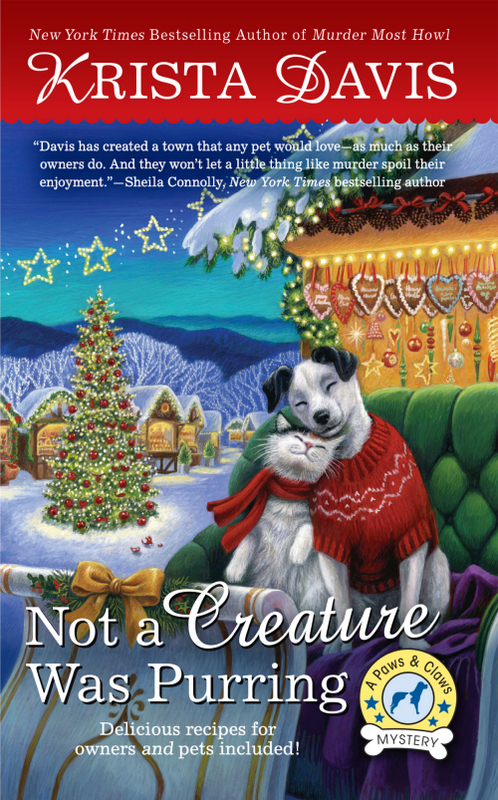 Have you read Not a Creature was Purring yet? I have one for someone's stocking! To enter to win, leave a comment with your email address so we can contact you if you win! I love a good stollen. moodiesmum(at)yahoo(dot)com. Yes, I love making stollen. This is the homemade treat I make and give out to friends for Christmas. The one I make uses dried apricots and currants but I like the idea of using dried cherries. 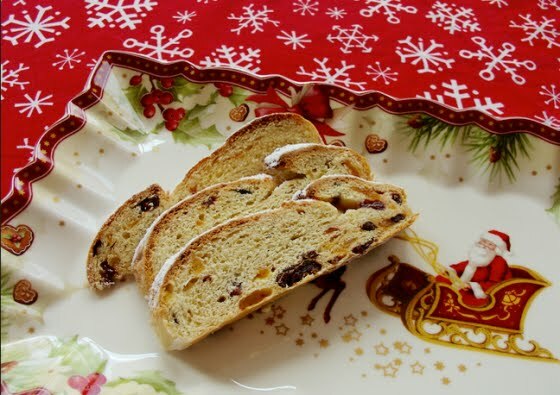 Stollen is better than receiving/eating maligned fruitcake as a gift. No one in my family likes candied fruit (at least, not the usual commercial stuff), so my mother found a recipe ages ago for a fruit cake with dates, raisins, nuts, and chocolate chips. A winning alternative. Your stollen sound like a similar winner. This bread looks yummy. I like that you can add different fruit depending on your tastes or mood. Hee Hee, animals can make cooking interesting! My copy of Not a Creature was Purring arrived as if had come through a battle. I'd love a lovely copy with that gorgeous cover and I can donate my, as yet unread, battle scarred one. Thanks for the chance. I would make it without the rum if I was going to make it. I never liked the flavor (and that was before I stopped drinking). But it certainly looks tasty. Great series! I'm looking forward to reading "Not a Creature Was Purring". Merry Christmas and Happy New Year.